Comics are a visual medium, but so often criticism of the medium hinges on narrative, ignoring or minimizing the visual storytelling and unique structures that make comics so different from cinema and photography. We’ve decided to change that up with a feature in Loser City that we’re calling anatomy of a page, in which we explore pages and panels that showcase the language of comics and how the best visual storytellers maximize the freedom of comics in order to tell stories that can’t be told anywhere else. 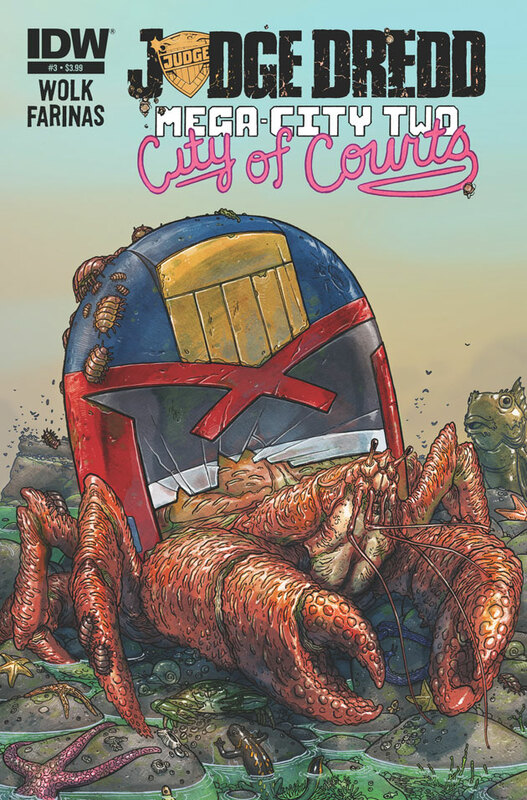 Today we’re looking back at Ulises Farina’s work on page 22 of Judge Dredd: Mega-City Two: City of Courts #3, which is written by Douglas Wolk and is available now from IDW. 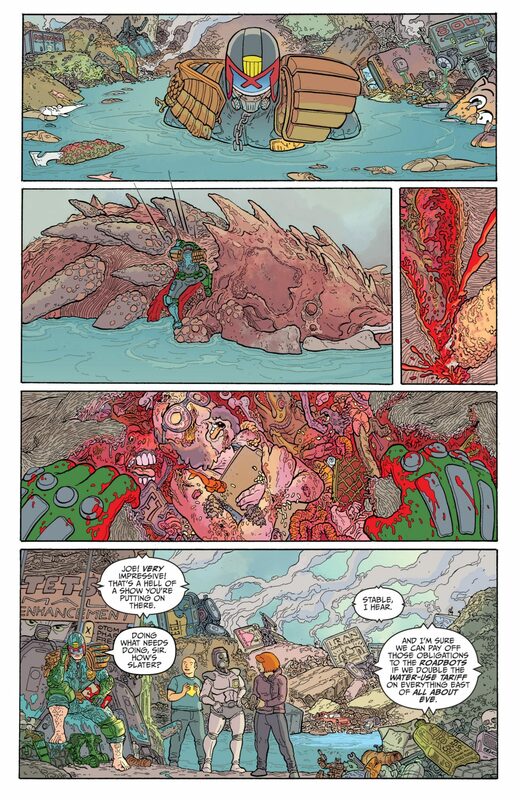 Hopefully my review of Judge Dredd: Mega-City Two: City of Courts #3 made it pretty clear that I think Ulises Farinas is one of the most promising creators in comics today, but in case I didn’t make it clear enough, I’m devoting this week’s Anatomy of a Page to one of the issue’s best sequences, which happens to also have a great backstory. 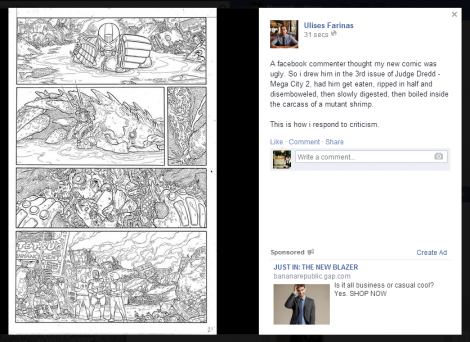 As well as providing that backstory, the screengrab also provides an interesting look at the behind-the-scenes process for Farinas’ art. Even uninked and uncolored, Farinas’ page is beautifully disgusting, a highly detailed work that is full of sight gags, references and interesting perspectives but never feels cluttered or cumbersome. Farinas is unafraid to shift between perspectives, counting on the visual feast of each panel to force the reader to read at a slower pace in order to take it all in and thus more than prepared when the page moves from a close shot focused directly on Dredd’s upper half and the filthy background to a medium shot of Dredd from the back, forcing the shrimp’s exoskeleton open, culminating in an extreme close-up of Dredd slicing through the exterior. The focus of the page is a panel from Dredd’s point of view, his hands framing the panel as we look inside the guts of the shrimp with him, to view the unfortunate critic who took on Farinas and Dredd. Ryan Hill’s colors up to this point emphasize the tranquil blues of the water Dredd is wading through, with the green and tan garbage color palette sticking to the background or taking a backseat to the burst of red that appears in panel three. But in the fourth panel, which is slimmer than the top and bottom of the page to match the POV perspective, the colors all come together, Dredd’s gloves matching both the garbage and ocean tones while a vivid burst of pink and red ground the eye at the center of the frame. Dialogue is notably absent from all but the last panel on the page, where the scene zooms back out and the colors become more muted. Dredd is relaxed, his boots are off and he’s calling back to HQ while his crew excitedly takes stock of the action, giving the reader a chance to drink it all in, too. 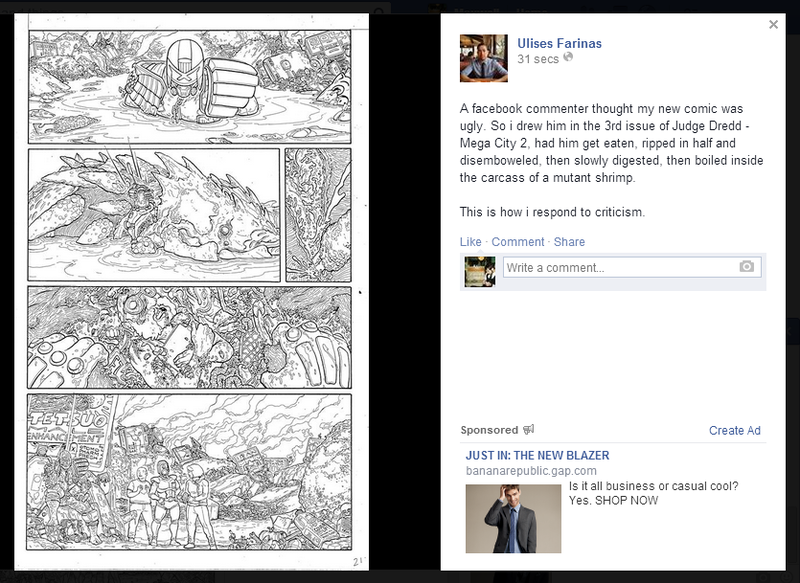 Farinas takes this opportunity to pack the background with a multitude of easter eggs, like an Akira­ referencing billboard for “Tetsuo Male Enhancement” and a tiny, dingy Transformer, and there’s also more humor here, from the fish flopping around in Dredd’s holster to a container of “Cover Up!” which promises to “Remove all bodily fluids!” Some critics try to minimize Farinas’ accomplishments, labeling him a Darrow or Moebius copycat, but Farinas’ playfulness and masterful handle on expression and perspective prove he’s more than the sum of his influences.